Cerec are an acronym for Chairside Economical Restoration of Esthetic Ceramics. 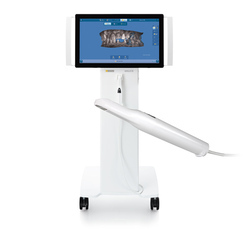 CEREC has revolutionized the way our practice can deliver treatment to patients like you. This high tech equipment allows us to restore damaged teeth in a single visit. The result is a beautiful, natural colored restoration that is much stranger than before. CEREC is the world’s only system for the fabrication of all ceramic dental restorations in one office visit. Because Dr Wood uses CEREC, you can be in and out in a single visit with a permanent, all ceramic crown, onlay, or veneer! What does that mean for you? Fewer injections, less drilling and less time out of your hectic schedule for dental care. Most Dental restorative methods require more than one visit to the dentist. On the first visit, you get an injection of anesthesia, your tooth prepared, an impression taken, and a temporary restoration put on your tooth. You make a second appointment for a couple of weeks later, get another injection, have the temporary prided off (if it hasn’t fallen off already), and have the permanent restoration put on. Why go to the dentist a second time when you don’t have to? With CEREC, the procedure is done in a single appointment, start to finish.